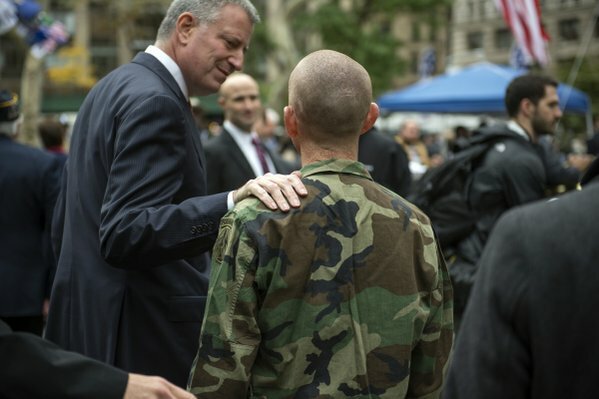 "When Mayor de Blasio first took office in January 2014, there were over 1,600 homeless men and women who served our country in our shelters or in our city streets," said Loree Sutton, the commissioner of the Mayor's Office of Veterans Affairs and a former Brigadier General. Adding that the administration has drastically reduced that number, Sutton said that "our street homeless count today is only eight veterans." Ninety-three percent of New York City's homeless or recently homeless veterans, Sutton added, currently have a rental subsidy or are in the process of getting one, and more than 300 are currently in the process of moving from shelter into a new apartment. The hearing and its positive news followed Tuesday's victory for New York City veterans: the announcement that the city would create a new Department of Veterans Services to replace the the understaffed, underfunded, and under-performing Mayor's Office of Veterans Affairs. City leaders, veterans, and veteran advocates celebrated Tuesday and Wednesday, which was Veterans Day. "This is good news, indeed," Sutton said Thursday. The story is not quite simple, of course. "Obviously, the number that jumps out to me is eight street-homeless veterans in New York City by your count," said Council Member Stephen Levin, chair of the general welfare committee, in Q&A with Sutton after her initial testimony. "How do you determine that count? Are those people that you have an open case for? Are those people that you've identified as a veteran? Do you think that there are other homeless veterans living out in the street that you might not know of?" According to Sutton, "multiple vectors" are used to count veterans, such as counts from peer-to-peer coordinators and MOVA's housing outreach team. The question of the real number of street-homeless veterans was raised later at the hearing by Coco Culhane, director and founder of the Urban Justice Center's Veterans Advocacy Group. "I just want to say that I know that our client database has the names of men and women who are homeless and DHS [Department of Homeless Services] doesn't have those names," Culhane said. "And I think it's ludicrous to say that 'we know every single homeless veteran out there.'" In her testimony before the Council members, Culhane said that there are "at least twenty" homeless veterans not accounted for by the Department of Homeless Services, which collaborates with MOVA on veterans and housing. And, she added, only 20 percent of homeless rent vouchers issued by the DHS Living in Communities Program (LINC) - a component of the city's plan to house all veterans - are being used. Landlords often don't accept them - an issue for veterans and non-veterans that the city must combat. "I think that we need to absolutely celebrate the success of how much progress has been made," Culhane said of reducing homelessness among military veterans. "But keep in mind that 'functional zero' is a dangerous term, I think, and it signals to the public that we accomplished something and we're set and tax dollars solved it and we can move on, which is not true at all." Maintaining functional zero and being in compliance with the Mayor's Challenge to End Veteran Homelessness, the plan for mayors nationwide created by the Obama administration, will require that the city house all homeless veterans within 90 days of their loss of housing. In his February State of the City address, Mayor Bill de Blasio promised to house all veterans by the end of the year - de Blasio signed onto the challenge when it was created in June 2014. Though the mayor has been unpopular with veteran advocacy groups, his support for the creation of the new department for veterans services may signal a turning point. Announcing an "end" to veteran homelessness in the city could help too. "I think [the mayor's effort to end veteran homelessness] is a great idea," Dwight Curry, a Gulf War veteran and member of the Iraq and Afghanistan Veterans of America, told Gotham Gazette on Tuesday at a rally to celebrate the new department. "I think it's a beautiful idea because there's too many of us that are homeless. There's a lot of guys who've got a lot of psychological problems who can't really deal with society as we know it." Veteran advocates, who spoke at Thursday's hearing, were cautiously pleased about the city getting to functional zero. In her remarks, NYC Veterans Alliance Director Kristen Rouse echoed Culhane's concerns about the grasp the city has on the actual number of homeless veterans. "When the city talks about functional zero, we must take into account the many veterans who still remain invisible to the system," Rouse said. "And that younger veterans in particular, who are contending with New York City's stark economic realities, may be at risk for homelessness in the near or long-term." Part of what veterans and advocates want to see from MOVA and then the department that replaces it is a focus on helping veterans access physical and mental health care, jobs, housing, and, for those who own businesses, city contracting opportunities. The city will also be expected to better help veterans returning home to find quickly find affordable housing. Even when veterans successfully find housing, the expensive market creates difficulties for sustaining their apartments, Rouse pointed out. "Veterans must be included in any city effort to provide affordable housing, not just for the recently homeless, but to prevent veteran homelessness in the future."